At the time of his death in 1749, Maratha emperor Shahu appointed a Peshwa (chief minister) as head of state with certain conditions that he must follow. The Peshwas became the de facto leaders of the Maratha empire, while Shivaji's successors continued as nominal rulers from their base in Satara. 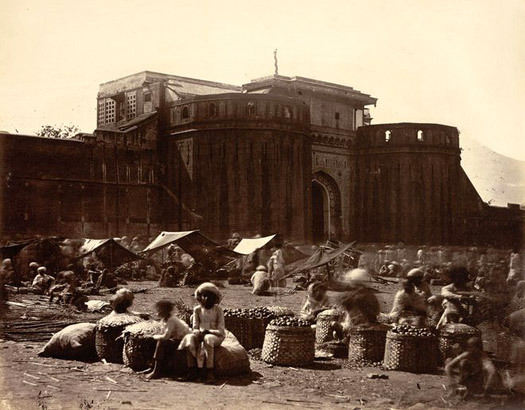 The authority of the Peshwas was weakened after the First Maratha War, which took place against the British East India Company between 1775-1782. The Maratha losses at the Third Battle of Panipat in 1761 has already halted the expansion of the empire and reduced the power of Peshwa. After 1782 the empire became a looser confederacy, with political power resting in a 'pentarchy' of five Maratha dynasties: the Peshwas of Pune, the Sindhias or Shindes of Malwa and Gwalior, the Holkars of Indore, the Bhonsles of Nagpur, and the Gaekwads of Baroda. Maratha and first (unofficial) peshwa. Peshwa (chief minister) under Maratha Shahaji Bhosale. Peshwa under Maratha Shivaji Maharaj. Peshwa under Maratha Raja Ram. Peshwa under Maratha Shahu I.
Bhatt family civilian representative of the Maratha emperor. Shahu appoints a Peshwa (chief minister) as head of the Maratha state with certain conditions that he must follow, making the position an hereditary one. The Peshwas become the de facto leaders of the empire, while Shivaji's successors continue as nominal rulers from their base in Satara. Son. Appointed by Maratha emperor Shahuji. The Portuguese viceroy of Goa concludes a treaty with the Marathas. Peshwa Baji Rao I has been successful in his expeditions to subjugate the regions of Malwa, accompanied by Maratha Sardar Udaji Pawar and his brothers. In recognition of the services of Udaji Pawar, he is rewarded with the jagir of Dhar in 1728. The Maratha emperor, Shahuji, appoints Baji Rao the commander of his imperial army, which is well-trained and very experienced after its long and hard battles. Baji Rao, true to the expectations of his master, carries out his duties well from his capital at Pune. The Maratha army reaches Rajasthan in 1735, Delhi in 1737, and Orissa and Bengal by 1740, and Baji Rao dies in 1740, having consolidated the power of the Marathas. On the way back from Delhi, Baji Rao's generals establish their own holdings which later become kingdoms in their own right, still owing loyalty to the Maratha throne in Satara. The Gaekwads establish themselves in Baroda (modern Gujarat), the Holkars at Indore (in the present day state of Madhya Pradesh), and the Shindes (later known as Scindias) at Gwalior (in Madhya Pradesh). Baji Rao himself also gains part of the Bundela kingdom of Panna through his marriage to the former king's daughter. Nanasaheb proves to be an able ruler until his last act. He sends an army to challenge the Afghans under Ahmad Shah Abdali, and the Maratha army is decisively defeated on 13 January 1761 at the Third Battle of Panipat. Maratha internal feuding costs them greatly in this battle, which checks their expansion, prevents the capture of Delhi, and encourages the fragmentation of the empire (even today the phrase in Marathi, 'meet your Panipat', has a similar meaning as the phrase 'meet your Waterloo' does in English). Unable to cope with the defeat, and the loss of his son, Vishwasrao, and his brother, Sadashivrao Bhau, Nanasaeb dies soon after. Surviving son. Died of tuberculosis. Janoji of Nagpur attempts to play power politics in the war between the Peshwa and the nizam of Hyderabad. Betraying both of them in turn, they surprise him by uniting and destroying Nagpur. His eventual death leads to a period of intense instability in Pune. Dissident uncle who unsettled the empire. Younger brother of Madhavrao I. Killed on Raghunathrao's orders. Seized the throne. Not recognised by emperor and overthrown. Former minister. Seized the throne and installed a puppet. Former minister Nana Phadanvis seizes the throne and installs Madhavrao II. Nana Phadanvis manages the affairs of the Maratha confederacy through a twelve member regency council also called the Barbhai Council (comprising of Haripant Phadke, Moroba Phadnis, Sakharambapu Bokil, Trimbakraomama Pethe, Mahadji Shinde, Tukojirao Holkar, Phaltankar, Bhagwanrao Pratinidhi, Maloji Ghorpade, Raste, and Babuji Naik). Puppet of Nana Phadanvis. Allegedly jumped from castle walls. The First Maratha War takes place against the British East India Company. The empire becomes a looser confederacy, with political power resting in a 'pentarchy' of five Maratha dynasties: the Peshwas themselves in Pune, the Sindhias of Malwa and Gwalior, the Holkars of Indore, the Bhonsles of Nagpur, and the Gaekwads of Baroda. Brother. Puppet of Nana Phadanvis (to 1800). Nana Phadanvis dies at Pune on 13 March, just before Baji Rao II places himself in the hands of the British. A situation of near civil war exists by 1802, when two Peshwa generals, Daulatrao Shinde of Gwalior and Yeshwantrao Holkar of Indore, start fighting between themselves. Bajirao II aligns himself with his mentor, Daulatrao. However, Holkar ultimately triumphs, and Baji Rao flees to Bombay in September 1802, to seek help from the British who, fresh from their successes in other parts of India, are waiting for an excuse to take on the Marathas. But the Peshwa's move infuriates the Shindes of Gwalior and the Bhosales of Nagpur, who considered it a insult to Maratha self respect. They chose to fight, in the Second Maratha War (1803-1805), but both are defeated by the British. The Holkars of Indore join the war late, and eventually force the British to agree peace terms. The Third Maratha War results in a decisive victory for the British against the Peshwa. Amritrao rules as Peshwa for a short time during the war, when Yashwantrao Holkar is besieging Pune, but the British restore the rightful ruler soon afterwards. The Marathas are bound by treaty to the British Bombay presidency in India. They appear to rule, but are little more than puppets under the command of the British. Baji Rao is exiled to Bithoor (near Kanpur in Uttar Pradesh) as a pensioner of the British, although he retains his title for life. The Maratha states of Kolhapur and Satara retain local Maratha rulers. Adopted son of Baji Rao II & nominal Peshwa. The nominal Peshwa, Nanasaheb II, together with his minister, Tatya Tope, attempt to revive Maratha glory. He assists the mutineers in the 1857 Great Mutiny, or Sepoy Mutiny, in India. However, after the fall of Kanpur, Nanasaheb disappears without trace. His minister is executed by the British in 1859.